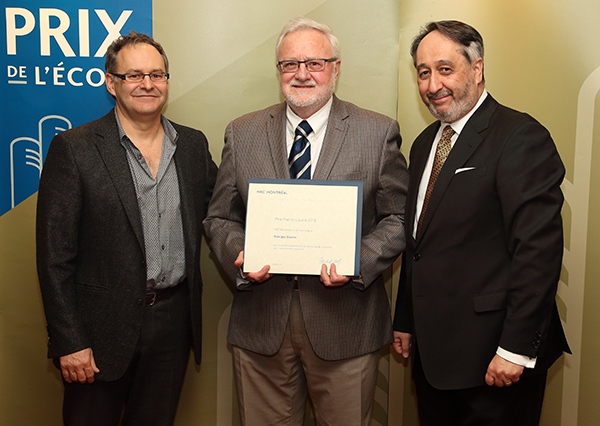 Georges Dionne and Jean Talbot have won the School’s top research and teaching awards for 2016. These distinctions, presented at the annual award ceremony, crown the careers of individuals who have gained their peers’ highest respect. Georges Dionne is a Professor of Finance, and has held the Canada Research Chair in Risk Management at HEC Montréal since 1996. From the time he arrived at HEC Montréal, Professor Dionne began developing the field of risk management, and has succeeded so well that today it is a major and distinctive field of expertise at the School. He is also a researcher with the Interuniversity Research Centre on Enterprise Networks, Logistics and Transportation (CIRRELT), and a past President of the European Group of Risk and Insurance Economists (2014) and the Canadian Economics Association (2013). He served on the HEC Montréal Board of Directors from 2009 to 2015, and is currently a Board member of SCOR Canada and Chair of the reassurance company’s Risk Committee. Professor Dionne’s renown and influence as a professor and researcher extend well beyond our borders. He has published over 170 papers in scientific journals and edited 5 books, including the Handbook of Insurance. This reference work, described as an outstanding contribution to the literature on risk and insurance by the American Risk and Insurance Association, is used around the world. It has been translated into Chinese and has received several international awards. He is ranked as one of the world’s top 20 researchers in risk management, according to the IDEAS site, and one of the 20 leading Canadian economists. Google Scholar gives him an h index of 43 and ranks him as the 4th-most widely cited researcher in the world in the insurance field, and 24th in the area of risk management. Jorge E. Hirsch, creator of the index, considers that after 20 years only an “outstanding scientist” will have a rating of 40. Professor Dionne has directed over 90 Master’s theses, 30 PhD dissertations and eight postdoctoral internships. 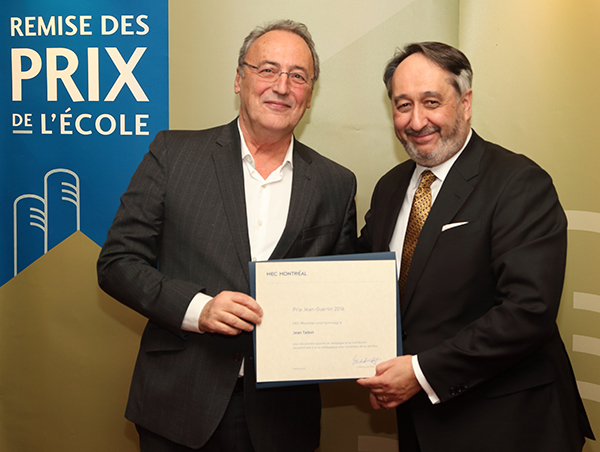 In 2011, HEC Montréal presented him with the Jean Guertin Award, its top recognition of teaching excellence. That same year, the Royal Society of Canada (of which he has been a member since 2000) awarded him the Innis-Gérin Medal for his eminent and sustained contribution to the social sciences in Canada. Jean Talbot is a Full Professor, Director of the Department of Information Technologies and Pedagogical Director of the Learning and Teaching Innovation Centre. He is especially interested in IT-led organizational transformation, business process management, IT governance and IT applications in higher education. In 2010, he became the first Director of the Learning and Teaching Innovation Centre. As such, he has carried out several strategic projects for the School, in particular the creation of EDUlib, the platform for free online courses for everyone. It was a first in Quebec when it launched in November 2012. Four years later, EDUlib has provided access to some 20 online courses offered by HEC Montréal, the Université de Montréal and Polytechnique Montréal. From 2003 to 2009, Professor Talbot was the School’s MBA Program Director. He introduced many innovations during his mandate and saw the program climb in the international rankings. He instituted the HEC Montréal Challenge, in which companies can have teams of students devise solutions to their management problems. He also created the first Campus Abroad course with Louise Séguin Dulude, who was Director of the Department of International Business at the time. He has also made an important contribution to teaching materials, as co-author, with Professor Suzanne Rivard, of the first three editions of Le développement des systèmes d'information : une méthode intégrée à la transformation des processus. This summer, his case co-written with Professors Ryad Titah and Pierre-Majorique Léger won the 2016 AIM-CCMP Award for the best case study in information systems, in Paris. Professor Talbot holds an MBA from HEC Montréal and a PhD in Information Systems from the Université Montpellier II. His research work has been published in MIS Quarterly, Journal of MIS and Information & Management.